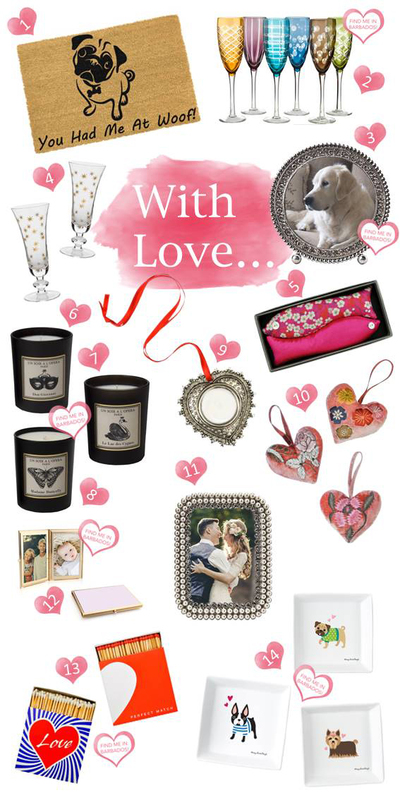 17 Perfect Presents for Valentines Day! Love is in the air once again as February 14th fast approaches. If the thought of choosing a Valentine’s Day present fills you with dread, relax! Today I’m pleased to share 17 unique ideas that are far more exciting than a bunch of red roses (and much longer lasting besides!). I always think that Valentine’s Day is the perfect time to show anyone in your life how much you care and of course, it’s the perfect time to treat yourself too! I hope you enjoy these gift ideas which can all be ordered online via our Trouva boutique. As always there is so much more to discover inside both our London and Barbados showrooms – do drop by and see what catches your eye! This elegant cake server is perfect for weddings and anniversaries – present it as a gift this Valentine’s Day and enjoy it for years to come. These Love Bird coasters are made from tumbled Italian marble and feature two birds nestling on the branch – a romantic accompaniment to drinks by the fireside! This scented candle contains sweet top notes of velvety peach and fresh mimosa petals giving way to middle notes of Turkish rose invigorated by a kick of rich, peppery saffron. Honey and warm patchouli aromas take the base notes into a world of intense sensuality that is sure to spice up an evening at home. The glass canister with handmade lid featuring love hearts makes the perfect trinket box once the candle is finished! This heart shaped leather coin purse makes a fun but practical present for Valentine’s Day and beyond! The claret coloured leather will only get softer and more beautiful with age. A miniature picture frame with a photo of a cherished memory is a thoughtful and touching gift. This frame which is handmade from nickel-plate is a timeless, feminine design which is sure to be cherished. Whilst the girl sports a pretty, Liberty print dress perfect for Spring. Valentine’s Day is the perfect excuse to spoil your inner child with these gorgeous cuddly toys. A beautiful notebook is always well received and this one in pale pink with its two nesting birds is perfect for Valentine’s Day! A pair of martini glasses is a wonderful Valentines gift for ladies or gentleman and leaves only one question: shaken or stirred? This twin photo frame featuring blue enamel is the perfect place to display precious photographs. A beautiful bottle opener makes a great gift for men – this one is hand crafted from nickel-plate and stainless steel and features a unique rope twist handle. Belle Fleur candles are ‘haute couture for the senses’. Present the lady in your life with a trio of the most exquisite scented candles available and you can’t go wrong. The Lovers ring catch is a modern take on a classic design which is the perfect place to store trinkets and treasures on top of a dressing table. Bright, fresh and fun, this cushion is exquisitely embroidered with a noble big cat making it perfect for the tiger in your life. These elegant black glass candle holders look simply stunning on a mantelpiece or to set the scene for a romantic dinner. The clever, versatile design works with tea light, tapered or pillar candles depending on your style. Naughty or Nice? That is the question with this duo of scented candles. Choose from either notes including cinnamon, orange and clove or blood orange, grapefruit and nectarine depending on your mood. For the young-at-heart this fluffy heart shaped pom pom makes a thoughtful gift. Clip it onto keys to make finding them at the bottom of a handbag a breeze!